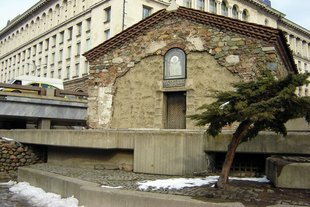 Saint Petka Samardzhiyska Churchis located at the city center of Sofia.During the Middle Ages the neighborhood of samardzhiyas – masters of saddlers and harnesses – was around the same area. That is why the church is named after Saint Petka Samardzhiyska – patroness of samardzhiyas. The temple was built in IX century on an old Roman tomb. The oldest frescoes in the church are from IVX century. The church is one partially dug into the ground. Its walls are made of stones and bricks. There is a hypothesis that the revolutionary Vasil Levski was buried in the church. Read more about Saint Petka Samardzhiyska Church at the Official Tourism Portal of Bulgaria here.